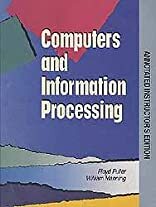 Examines various aspects of computers and data processing, including the components and functions of computer hardware, the applications of software, information processing systems, and the legal and social issues involved. About Floyd Fuller (Author) : Floyd Fuller is a published author. Published credits of Floyd Fuller include Computers and Information Processing.